So much has happened in the last 12 months, I’d say both Copiosis the organization and Copiosis the innovation look nothing like they did on July 4, 2014. I founded Copiosis by myself in 2013. 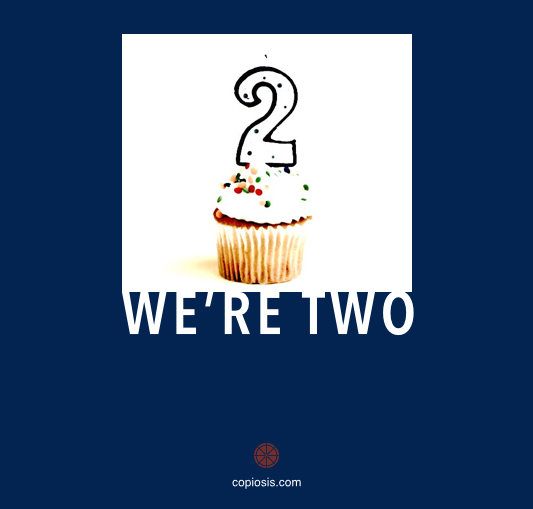 We’re two as of Today. Yay! We launched our Patreon page where people can become Copiosis patrons for far less than a coffee a month. As a result we’re bringing in more than $150 a month in patron support. A great start! All that is awesome. Major thanks to all the volunteers in Portland, Chico and around the world who are investing their precious time to make Copiosis real for the world. Without them, Copiosis is just an idea. What’s cool though about being two years old is we have a long fruitful path ahead of us. That’s exciting. With more people saying great things about our innovation, people we’ve not even met, I’m looking forward to being pleasantly surprised at what we’ve done by Independence Day 2016 next year. We’re doing great. Here’s how you can join us and be great too! Learn as much as you desire about Copiosis and how it works. Start here.